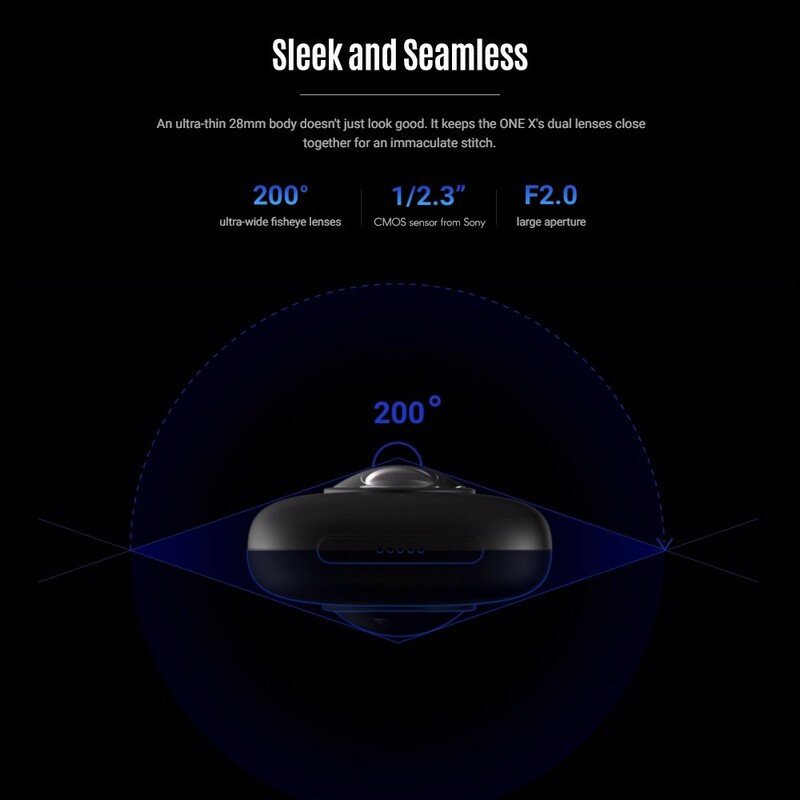 Sleak and Seamless: An ultra-thin 28mm body doesn't just look good. It keeps the ONE X's dual lenses close together for an immaculate stitch. 200° Ultra-wide fisheye lenses. 1/2.3 inch CMOS sensor from Sony. F2.0 Large aperture. 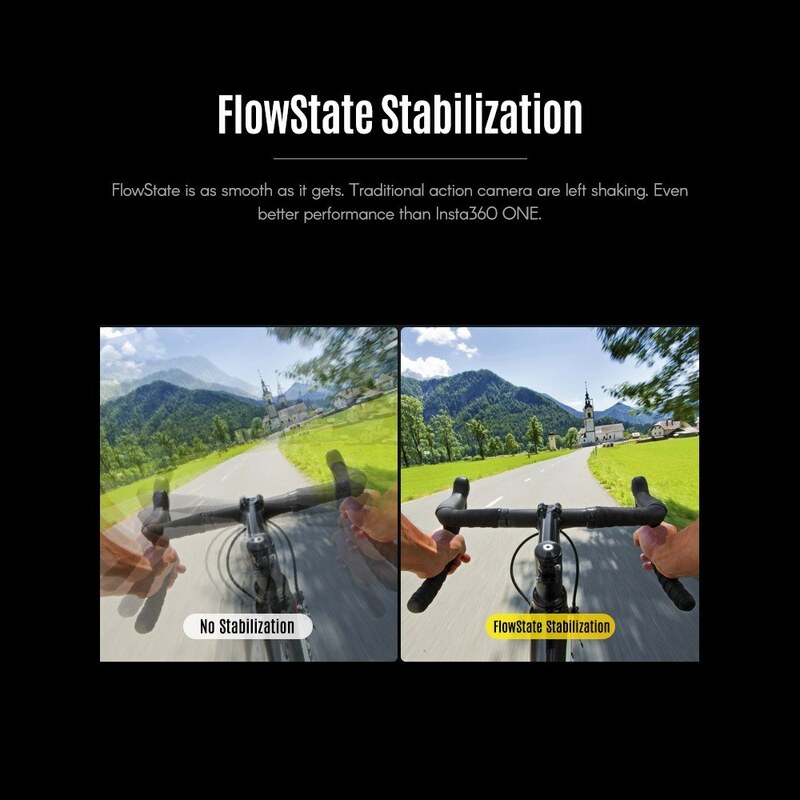 FlowState Stabilization: FlowState is as smooth as it gets. 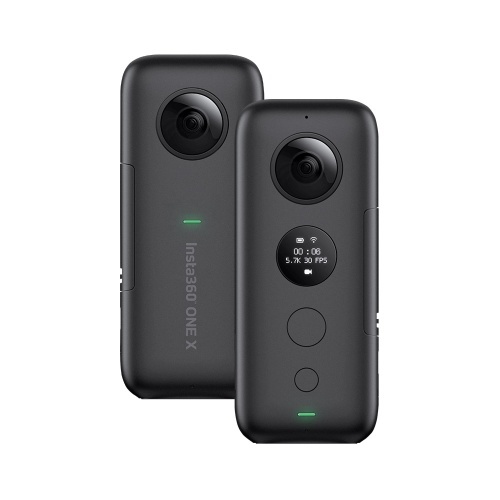 Even better performance than Insta360 ONE. Best-In-Class Image Quality: Look sharp. 5.7K 30fps, 4K 50fps, 3K 100fps. HDR Mode: Natural lighting in every direction. 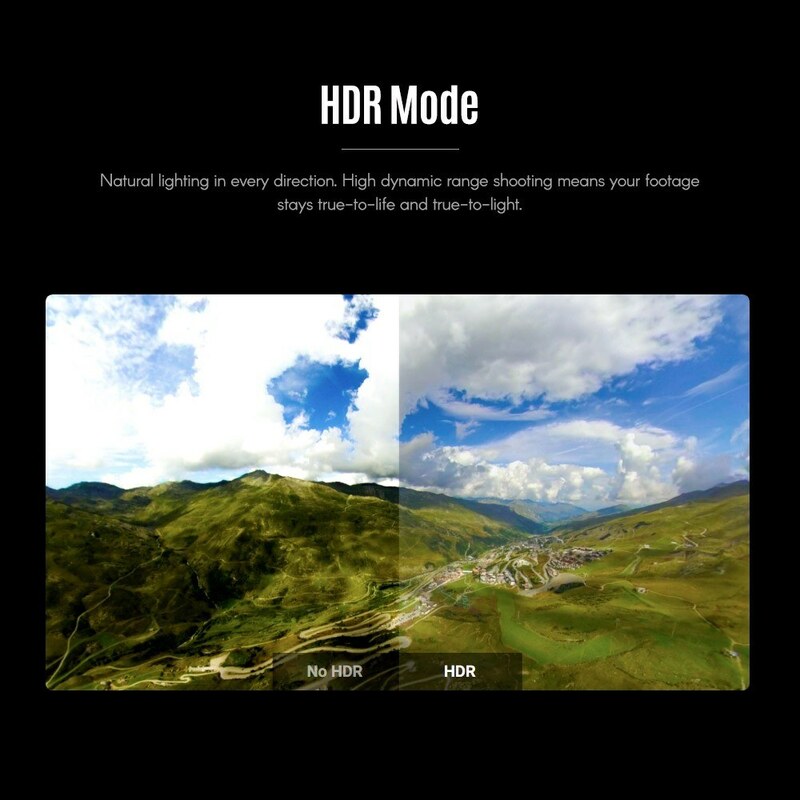 High dynamic range shooting means your footage stays true-to-life and true-to-light. 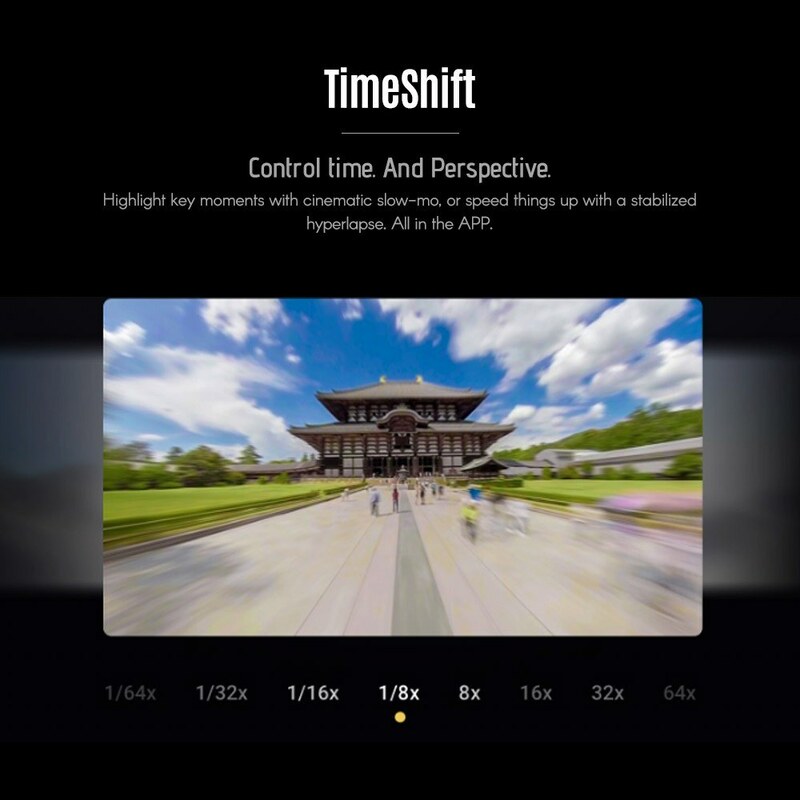 TimeShift: Control time. And Perspective. 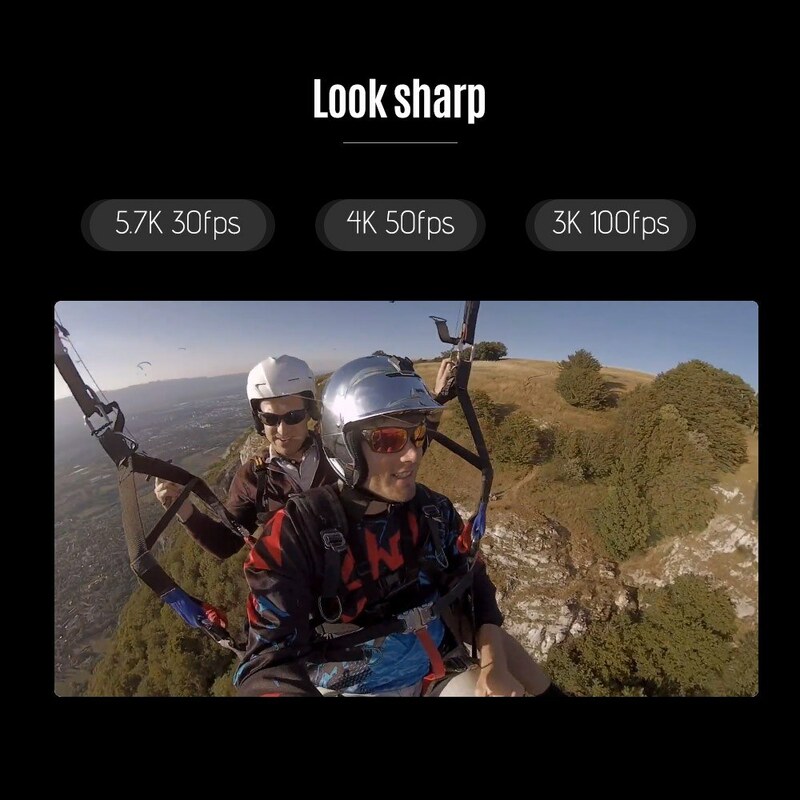 Highlight key moments with cinematic slow-mo, or speed things up with a stabilized hyperlapse. All in the APP. Shoot First. Point Later: Simple, stunning, cinematic editing. Reframe the best parts of your shot, and connect them with ultra-smooth camera movements. Then add your favorite music and effects. 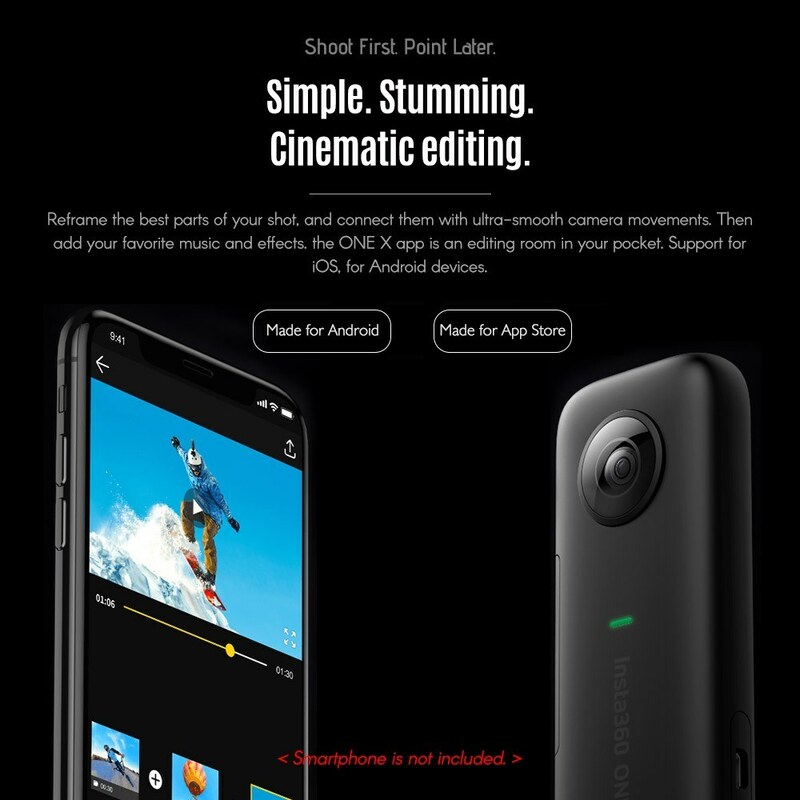 The ONE X APP is an editing room in your pocket. Support for iOS, for Android devices. 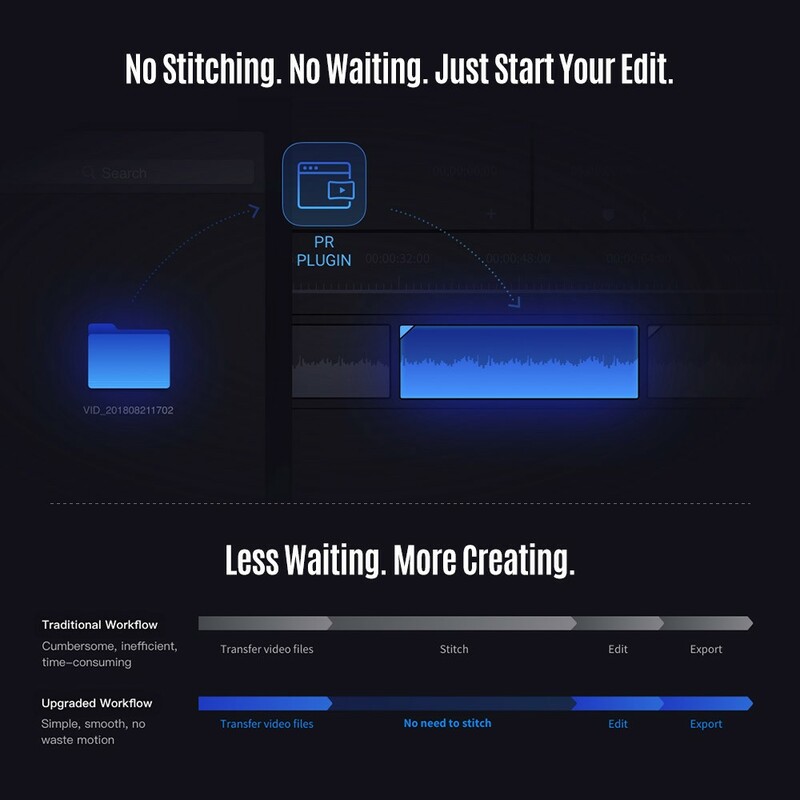 Adobe PR Plug-in: No stitching. No waiting. Just start your edit. Less waiting. More creating. 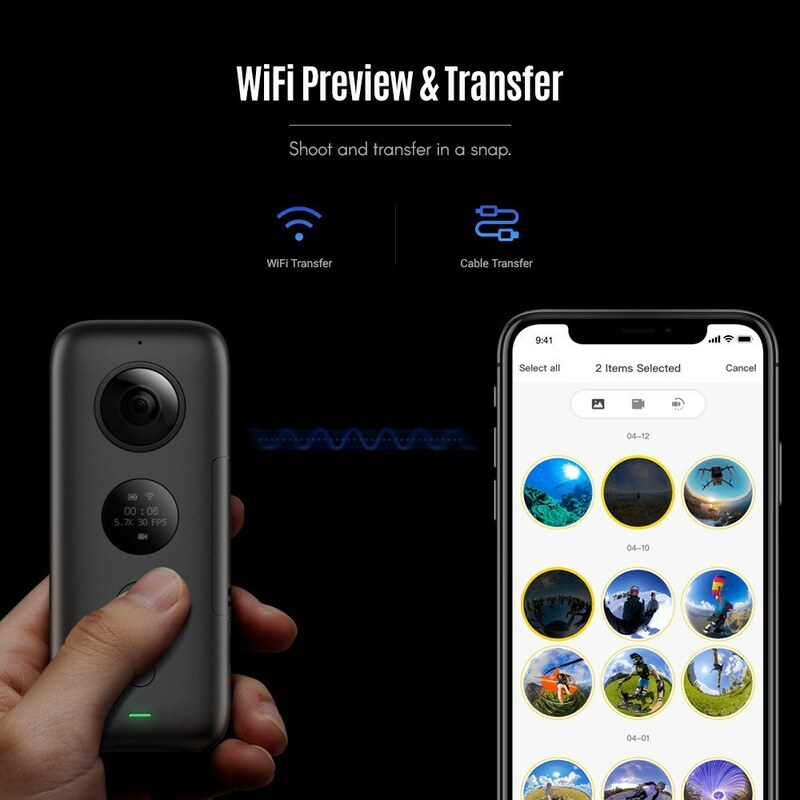 WiFi Preview & Transfer: Shoot and transfer in a snap. 360 Living-Streaming: Go live in 360 on your favorite platform. Start a broadcast with one tap and let family and friends see life from your eyes as you live it. 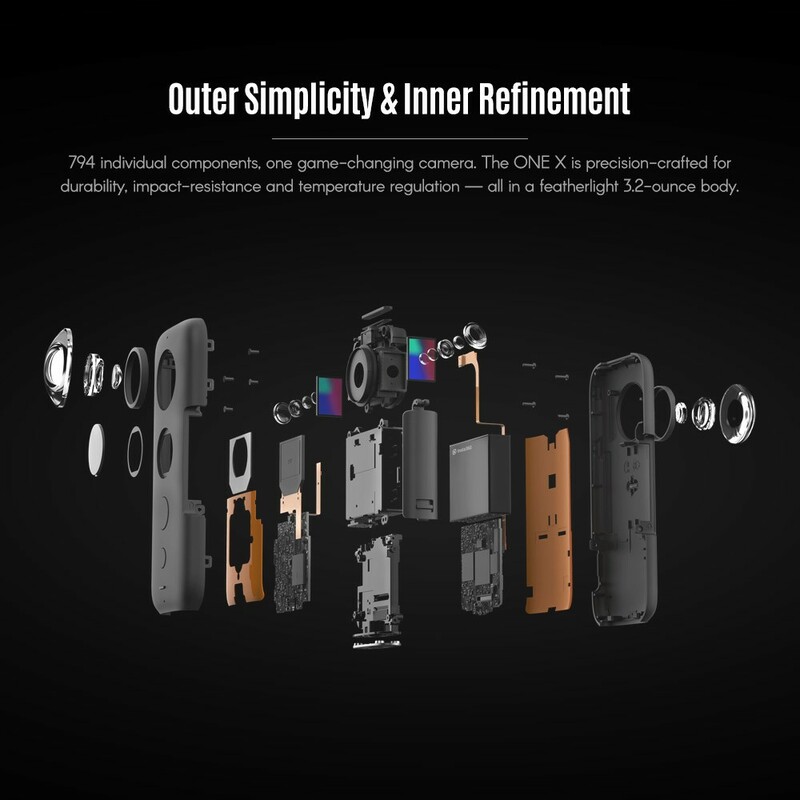 Outer Simplicity & Inner Refinement: 794 individual components, one game-changing camera. The ONE X is precision-crafted for durability, impact-resistance and temperature regulation — all in a featherlight 3.2-ounce body. Memory card is not included. Update: the camera arrives with the damaged memory card. The customer service has been receptive. It took a few days, but they sent me a new card. So I updated my comment to four stars. The quality of the video and the characteristics of the camera look very good in general. I can record the video directly on the iPhone, but I still can not use it. I'm closing a star for the interface of the iPhone application. It looks a little clumsy and unmanageable. But the company seems to be actively developing and adding firmware features and applications, so I hope this continues to improve. I use my camera for many application, 3d mapping customers offices, transitional content for professional video and creating outstanding photos for my social media. 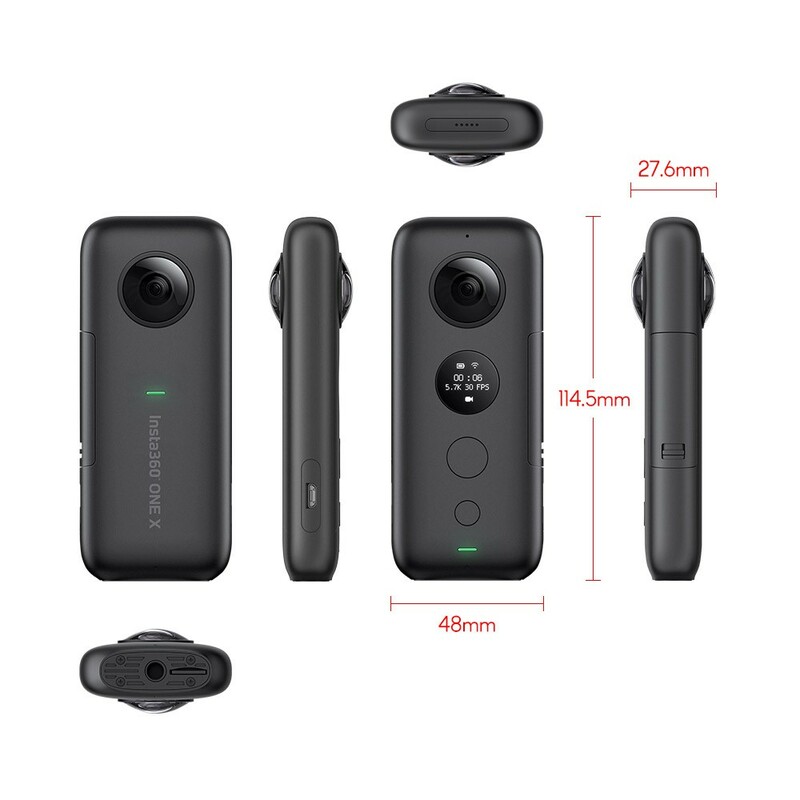 Insta 360 accessories and insta360 one camera are amazing, same great quality as its best competitors, lower price and better applications. You get more for your money, believe me :) I particularly like the bullet time effect and flow and state software applications. Great information on their website to better use their product and great free software to edit your content. As you see in this bullet time video, be carefull to your surrounding when you creat content ;) Like I did, do not forget to purchase the extended selfie stick if you want to give drone effects to your videos. I have purchased a bunch of accessories directly on their website, make sure you look carefully for the items included in the box, because you can end up with items in doubles. 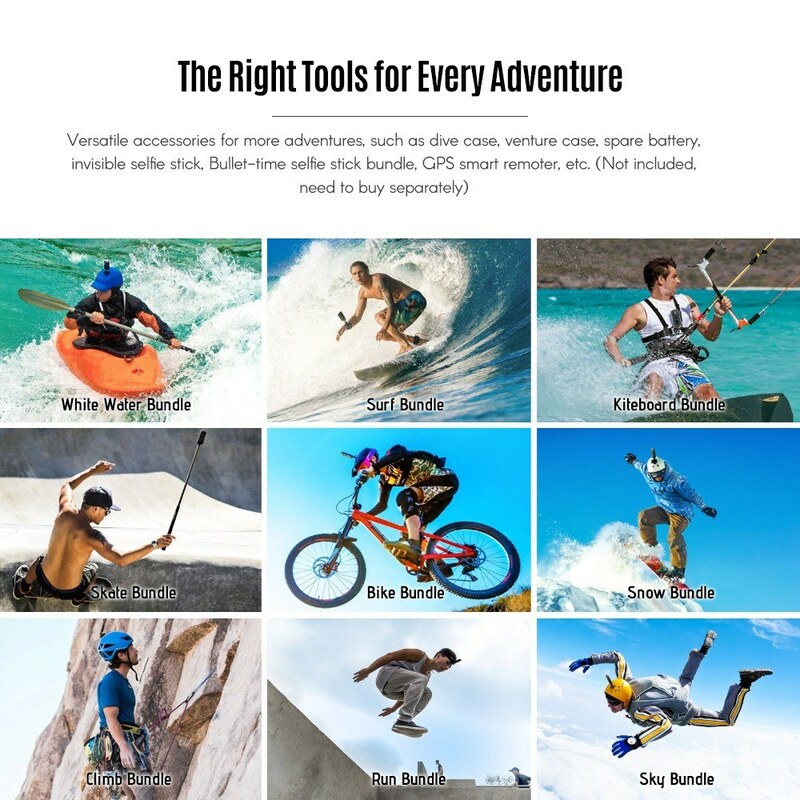 Some packages are better offers than others, like the soccer one, the included items can be used for climbing, skiing, etc. 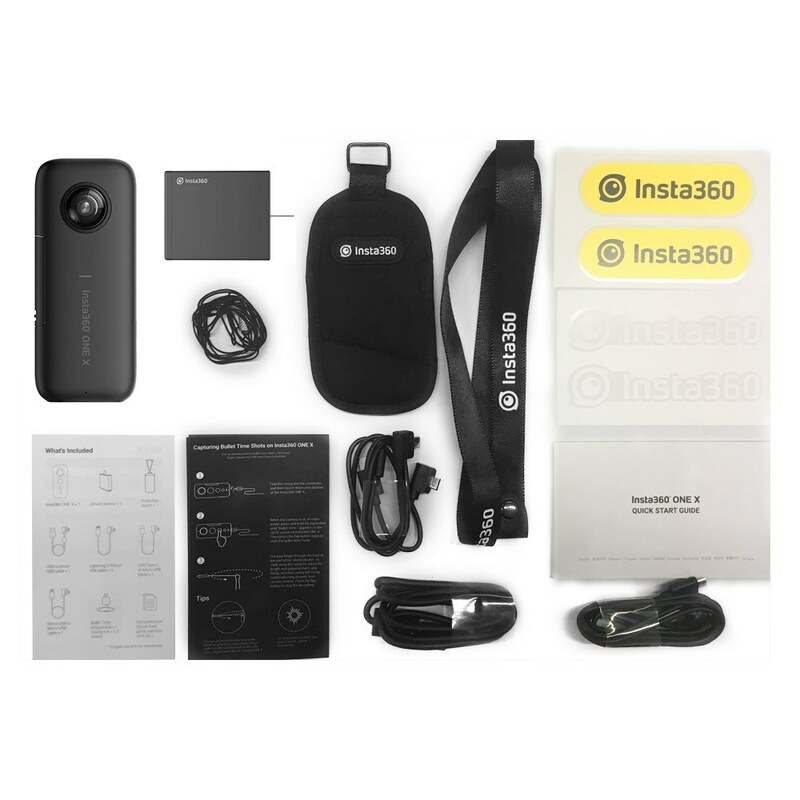 Although the good product in general has some shortcomings, I am very happy to have decided to buy Insta360 One and its ability to capture your life experience in 360 degrees. Disclaimer: I am an Android user, if I am an iPhone user, I will eliminate some deficiencies. Pros: Excellent software stability: this is an excellent application. Useful and easy to use functions in the software editor: intelligent tracking, address blocking, free capture. Beautiful shape: the "vertical" orientation on the stick or selfie monopod makes it not like a camera. Intuitive and easy to use when taking video / photograph. A fair entry price allows you to get a 360 degree experience (experience) and be able to edit (or not show) your content. Disadvantages: iPhone-centric: native hardware I / O is limited to iPhone, Android requires an adapter, but is not always effective. The software for iPhone / Android crashed 5% of the time. You must be connected to your phone to change the settings. The Bluetooth control does not work on my iPhone 5s. I have not complained. 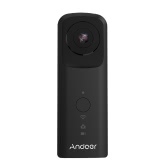 I have read all the reviews, this is the best 360 camera you can buy for beginners, not to mention that it is cheaper. The only thing I complain about is the battery life. Up to 3 hours of continuous recording. It can be solved by any portable mobile power source. I am planning to buy the rest of the accessories now. Although you could skip buying the selfie stick, you have more tricks than anything else. Finally, unlike any action camera, it is still difficult to record good videos in low light conditions, so keep this in mind when you buy. But during the day, it was great. In fact, I use it as a script camera. Advantages: 1. The videos and high resolution images are clear enough to be placed on any social network. 2. Decent software is sufficient for shooting and subsequent editing in manual mode 3. The small form factor contains a large amount. 4. The stand / casing is a good touch and versatile. 5. You can get the best video / image quality within this price range. Disadvantages: 1. You must buy a remote control Insta and a selfie stick. 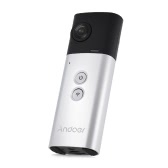 It is not paired with any other Bluetooth remote control. 2. The power button opens too easily and wastes the battery. 3. In what state the camera is after starting, taking pictures, videos or time lapses, etc., which is a bit confusing. Some of the most unique audio / visual tips will be excellent. 4. There will be some color infraction in most lighting and noise conditions in low light conditions. However, they are only a problem for professionals. In my opinion, most people do not notice them on social networks. 5. For most outdoor activities, you do not feel strong enough. Walking with him will be great. So far, using this camera is very easy. 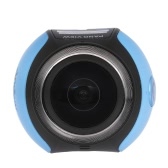 Open it and double-click the camera's single button to record the video. Like its size and price, it seems to be the best quality at the moment. Trying to edit the video is a bit difficult and I am still trying to handle it better. This is my first 360 camera, so I am still on the learning curve, but I am happy to see what I can do once I master it! I am very satisfied with the purchase, I will recommend it to my friends!